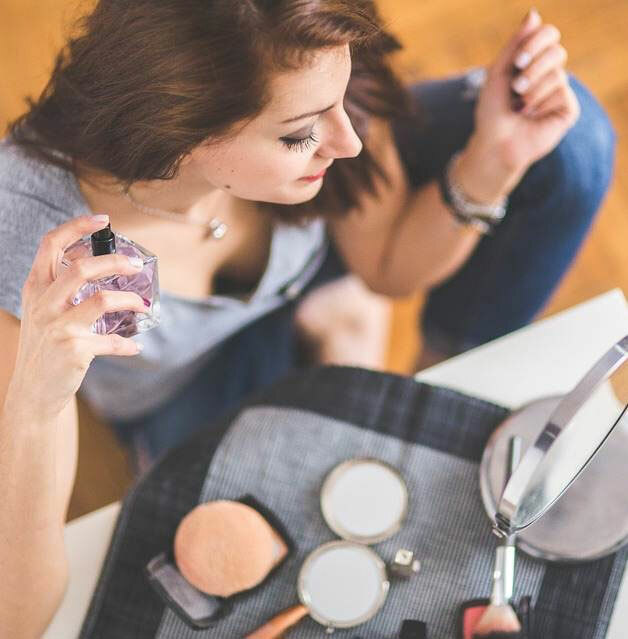 Home Articles Trends Cosmetic trends Perfume-skincare: the future of beauty? In addition to combining sensoriality and pleasure, it is known that smells have the power to trigger certain emotions and awaken our memory. According to dermocosmetology scientific expert Gérard Redziniak, the world of perfumery has not revealed all its secrets yet. What if it were possible to create perfumes with cosmetics functions and claims identical to the skincare products we use? He has offered us his expertise on this issue. Putting on perfume is one of our most usual gestures. To many of us, it is even a habit. But what do we actually want with this action? Smell good, feel at ease, or maybe even seduce other people. Hardly anyone expects perfume to smooth the skin or act on wrinkles. And yet, ‘it is an idea that deserves to be considered,’ asserts Gérard Redziniak. First, it is important to understand that a smell is a molecule which settles on a receptor. The latter sends an electric message to the brain which deciphers it. This mechanism is also regulated by memorization. As kids, we learn to associate words with smells, and we keep learning new associations all our lives. Does a perfume have the same power as an anti-wrinkle cream? Now, that is a tempting, definitely fanciful idea. Our scientific expert smiles as he evokes this point. To him, the concept is absolutely not crazy, quite the contrary: it even existed as early as the origins of life. 3.5 billion years ago, before Man even existed, smells actually helped cells get closer to one another. That is what we call molecule touch. In addition, smells help species reproduce. Pheromones actually guide males towards females. These chemical molecules induce a biological reaction. ‘If smells activate actions in the brain, why not have a closer look at the skin?’ Gérard Redziniak asks – rhetorically. Scientific research has already shown that the skin reacts to light thanks to keratinocytes. These are epidermis cells essential to our body and endowed with visual receptors. On top of helping the skin act as a primitive eye, it was recently demonstrated that keratinocytes also have olfactory detectors: they can smell! ‘Thanks to them, we will be able to create tomorrow’s cosmetics. They are incredible and fundamental. We should even rename them and call them Univer-Cell, because we owe them everything,’ Gérard Redziniak enthusiastically exclaims! Right now, researchers do not know whether keratinocytes react to all smells. This question offers an infinite number of answers. Therefore, it is definitely possible to imagine perfumed molecules that act on keratinocytes. These skin receptors ‘send an order’ to the body for it to help soothe the skin or have an anti-wrinkle effect, by triggering the production of collagen and elastin. ‘Olfactory cosmetics are attainable, smells will no longer be there to provide pleasure, they will also be actives,’ Gérard Redziniak adds. Perfume-skincare: what did you just say? If this concept is to emerge one day, what can consumers actually expect? A cream with a nice smell and whose perfume acts on the skin, or a perfume to be directly sprayed on the area to be treated? ‘Both are possible and can be considered,’ Gérard Redziniak answers. ‘It would also be a revolution in terms of skincare routine gestures. Of course, the contact would be instantaneous. However, the action on the skin would not be immediate, it would require some time. The galenic form will help these keys come more or less quickly in contact with the molecular locks on these fundamental cells known as keratinocytes,’ he adds. As futuristic as this idea may sound, it has actually been in Gérard Redziniak’s mind for a long time. *‘It was over 20 years ago. At that time, I worked for Estherderm and had registered a patent called Odor’Activ: smells that acted through the brain and provided an anti-wrinkle action. Then, I thought “it is weird, it acts on the brain, but maybe we can do that directly on the skin. Little by little, the idea caught on and I read in the literature that researchers had started working on the skin’s sensorial receptors. In 2011, Shiseido studies showed there are ocular receptors in the skin. Why would the skin not be a primitive nose? Last year, a fundamental research publication demonstrated that keratinocytes bear olfactory receptors. When I saw that, I realized we had finally come full circle. Perfume can go beyond emotions and has a physiological activity. We can create cosmetics starting from perfume,’* he explains. Thanks to scientific research and cosmetologists’ touch of madness, it is actually possible to imagine highly innovative cosmetics that would break the codes. And yet, Gérard Redziniak prefers to warn everyone that such products will not be available on the market anytime soon. ‘You need an olfactory dream team, you need to make people sit around the table, people that build smelling structures like cell biologists and CNRS researchers. It is definitely not something you can work on alone. Well, now, I am feeding this idea to your readers, hoping it will have some echo among my peers,’ he concludes.